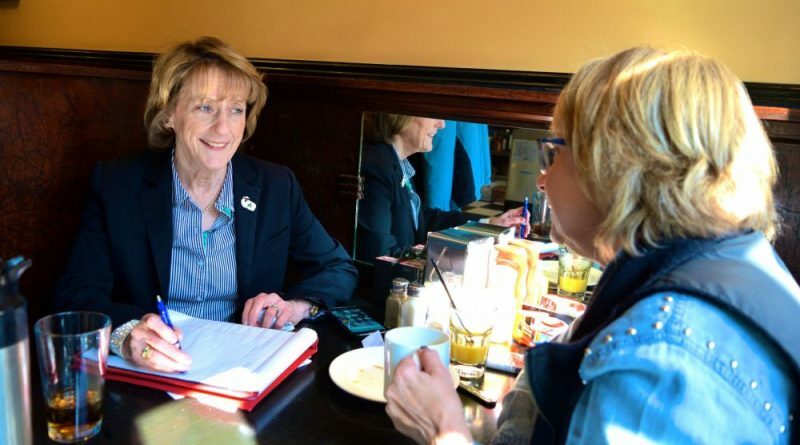 Leesburg Mayor Kelly Burk took her crusade to establish permanent office space for the town’s elected leaders to the streets this week, hosting office hours Monday at the Leesburg Diner. Burk, who has served as the town’s mayor for the past two years, said constituents tell her they are surprised to learn that the mayor and the Town Council do not have an office. Having dedicated office space would better relay a message of professionalism and significance, she said. “Even Andy Griffith had an office,” Maria Pierson, general manager of the diner, chimed in. As the Town Council prepares to adopt its fiscal year 2020 budget next week, adding funding for office space does not appear to have majority support. Town Manager Kaj Dentler has estimated that renting private office space, because of the Town Hall’s space constraints, could cost $30,000 annually. Burk said she hopes her colleagues wouuld consider what the impact of continuing not to have a dedicated mayor’s office and shared office space for the council will have for the future, even beyond their terms. “This is not forever,” she said of the required funding. Burk notes Dentler’s plans to eventually move staff from Public Works from Town Hall to the Utilities Department building following renovations there, freeing up some space. “It’s only a temporary solution until there becomes a final solution,” she said. Reporter Patrick Szabo contributed to this report. 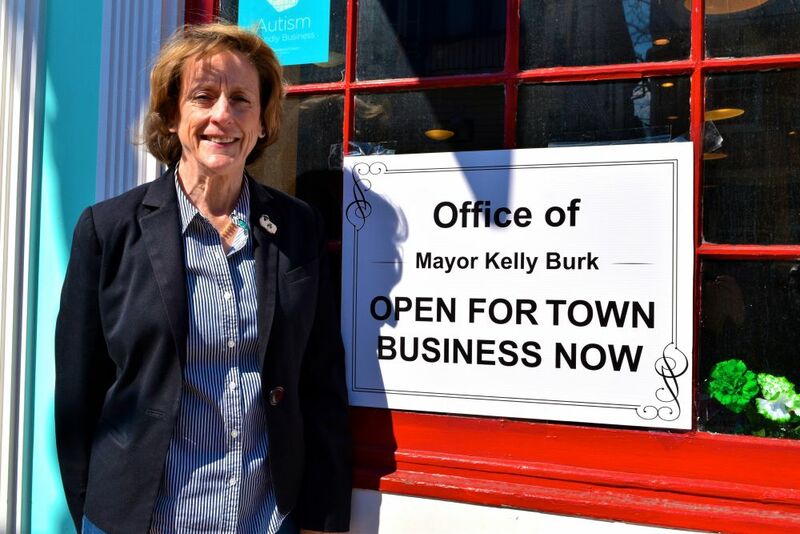 Leesburg Mayor Kelly Burk stands by a sign promoting her office hours at the Leesburg Diner. How about no office, no staff until the Mayor and Council start initiating things instead of just rubber-stamping what the staff wants? Supervisors have staff in large part because (1) the agenda packets and subcommittee packets are voluminous. The town budget is a fraction of the County budget, too. If you look at what is happening with this year’s budget the Council is doing nothing to make any changes the town manager wants (including a tax increase, which is not warranted). (2) supervisors have Board initiated items all the time! They need aides to handle that! (3) Leesburg is not a city with oversight over schools, courts, social services. County supervisors have more issues and departments to deal with (including schools funding, which is about 70% of the budget). 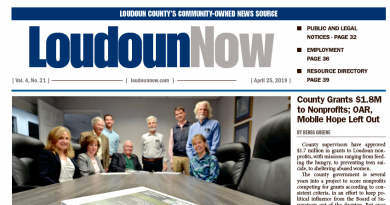 Finally, the Leesburg Town Council, on which I served for six years, has self-imposed limits on its power, i.e. the requirement that you need four councilmembers JUST to put something on the agenda for discussion, plus time limits on debate including time limits to ask questions about the budget! So, because they have tied their own hands and essence have punted all policy and specifics to the town manager and staff, neither she nor any other councilmember (all part timers) need an office. Her predecessors did fine without offices, although one of them didn’t bother initiating anything in 22 years in office either. But if we start seeing mayors and councilmembers who will lead instead of just being reactive, I may change my mind. She got her tax increase didn’t she.